The National are releasing a new album, Sleep Well Beast, on September 8 via 4AD. Previously the band shared a video for the album's first single, "The System Only Dreams in Total Darkness." Now the band have shared another song from the album, "Guilty Party," via its video. The band have also announced a two-day collaborative concert/mini-festival of sorts named after the song and taking place at Basilica Hudson, Hudson, NY on July 14th and 15th. The concert will be performed in the round and will feature The National, as well as Buke & Gase, Nadia Sirota, Mouse on Mars, Sō Percussion, and more. 700 tickets will be released for each night and are available here. Check out the "Guilty Party" video below, followed by the band's upcoming tour dates. Casey Reas directed the video for "Guilty Party" and had this to say in a press release: "The video is a dream about memory and the degradation of memory; it's about distance in time and space. Time moves forward, but then backward as memory. The image of the two-faced Roman god Janus, who can look into the past and future, is the core visual language." The National's Aaron Dessner produced Sleep Well Beast, with additional co-production by his brother Bryce Dessner and frontman Matt Berninger. It was recorded at Aaron Dessner's Long Pond studio in Hudson Valley, New York. Additional sessions took place in Berlin, Paris, and Los Angeles. Peter Katis mixed the album. 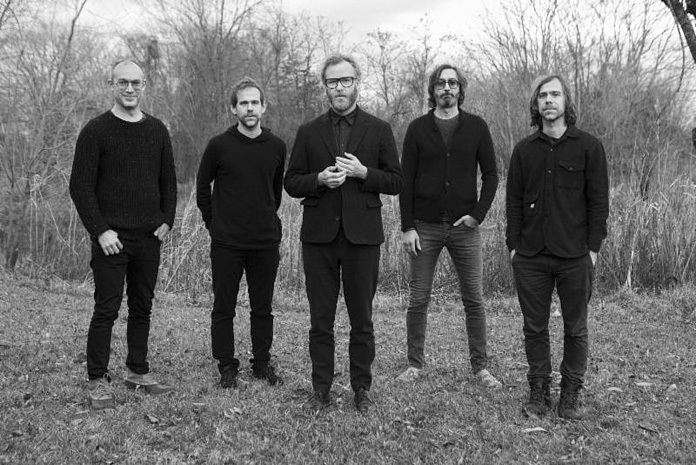 The National haven't released a new album since 2013's Trouble Will Find Me, although the band's members have kept busy with various side-projects.